For ride comfort, you'll want the Autoride suspension if you decide to opt for the showy 22-inch wheels. The 2013 Chevrolet Suburban is a traditional large SUV -- handsome and straightforward in design, purpose, and performance. If you need passenger space, yet you also need some of the capability of a traditional truck, the 2013 Chevrolet Suburban should be near the top of your shortlist. The Suburban not only continues as one of the widest, longest SUVs available; it's also, if you check the right option boxes, close to a luxury vehicle in features and cabin appointments--one with three spacious rows of seating. The Chevy Suburban is 20-inches longer than the Chevrolet Tahoe and it's closely related to full-size SUVs from GMC and Cadillac—the Yukon XL and Escalade ESV. Compared to GM's shorter-wheelbase SUVs such as the Tahoe and Yukon, the Suburban rides atop 14 inches of added wheelbase—which translates quite directly to third-row space and cargo room behind the final row. Larger rear doors also give better access to that third row. Those looking to max out on towing and hauling capability will want to opt for the Suburban 2500, which adds heavy-duty pickup specs to the full-size SUV without changing its interior accoutrements, but expect ride quality to suffer as it utilizes stiffer springs to boost its figures. 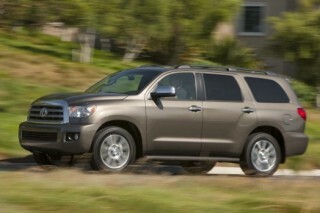 Fuel economy is also lower with the 2500 models, which pack a huge 6.0-liter V-6 making 352 horsepower. That said, the majority of families are better served by the 1500-series Suburban, with its smaller 5.3-liter V-8 and more compliant suspension. Its 320 horsepower is sent to the rear or all four wheels through a six-speed automatic. 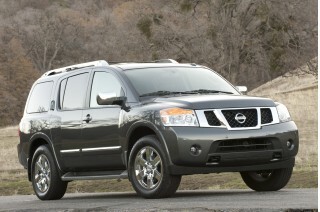 It's pleasant and responsive, with smooth shifts and quick downshifts, yet it can tow 8,100 pounds. And the wonders of modern engine controls mean it's now possible to fit large V-8s with fuel saving technology, like the Suburban's cylinder deactivation program that shuts of four of its eight cylinders under light loads when maximum power isn't needed. The 5.3-liter V-8 is rated at 15 mpg city and 21 mpg highway by the EPA. We're probably safe in thinking that handling isn't a top priority for those looking for a buff SUV that can tow, but we do think that the Suburban's excellent ride quality plus its good maneuverability and confident roadholding all add up to a vehicle that's a lot more manageable than you might guess based on its intimidating exterior. The Suburban's cabin has some good and bad. The good is that the 2013 Suburban maintains an interior that shames Japanese hotel rooms with its 137.4 cubic feet of cargo space aft of its front seats. Furthermore its simple, straightforward instrument panel offers the transparency and directness that many high-end infotainment interfaces lose in translation. But the down side is an overall outdated look and feel to its materials, trim, and layout. There's a lot of flexibility in how you get your Suburban (in terms of seating layout, materials, and features), but once you settle on one you may be a bit disappointed with the lack of flip-and-fold flexibility. Buyers can option buckets or benches for the front- and middle-row seats, but the third-row is limited to a pull-out solution that doesn't fold into the floor a la the Ford Expedition, which can power-fold its rear row out of the way. Further making the Suburban's third-row seat a royal pain, it requires two able-bodied people to remove it from the cabin—then you need to store it in your garage. Properly specified, the Suburban can seat up to nine people, even some smaller adults in back, though ideally the third row is reserved for kids. LS, LT, and LTZ trims of the 2013 Chevrolet Suburban remain offered, and both can be had with either rear- or four-wheel drive—though unlike the otherwise closely related Tahoe, there's no Hybrid model available. Bluetooth hands-free connectivity is standard on all models, as are cruise control, tri-zone air conditioning, and a six-speaker audio system with USB port and satellite radio capability. Moving up the trim ladder can net you an available and easy-to-use DVD-based navigation system provides real-time traffic data; rear-seat DVD entertainment; upgraded Bose audio; leather seating; power-adjustable pedals; ventilated seating; heated middle-row seats; remote start; and an electronic Autoride suspension. 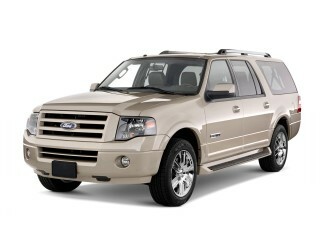 See our review of the very closely related 2013 Chevrolet Tahoe for more in-depth information.